There is a mysterious enclosed community hidden away somewhere on the North Wales coast where all sorts of dissidents and peculiar people are apparently detained, presumably for the benefit of wider society… and nearby there is also Portmeirion, the fascinating location of ‘The Village’ where the cult classic ’60s T.V. programme The Prisoner was filmed. Any coincidence between these places is probably coincidental but one cannot help thinking there may be a connection at times as a wide range of rock fans converge on this remote venue, some wearing appropriately psychedelic garb and clearly intent on becoming significantly ‘refreshed’. 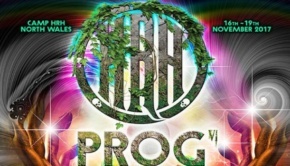 HRH Prog V was by far the largest manifestation of this annual event, with 2 stages, one in a substantial auditorium holding many, many more than the more modest settings of previous events. 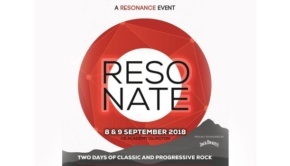 An eclectic mix of artists, ranging from top line Progressive rock acts and their more recent successors to veteran heritage rock bands, found their way to this remote location. Clearly, NOT all ‘Prog’ bands (whatever that means!) but clearly an attractive proposition for the thousands of fans that pack out the venues to a remarkable extent. These must be some of the largest crowds many of these Prog bands have ever played to, and if many came to see the classic rock of Wishbone Ash and the Stoner rock of Hawkwind and whilst there they also discovered less known Progressive bands that has to be a good thing. 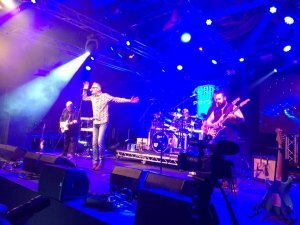 The HRH Prog ‘Pre-Party’ kicked off the weekend in grand style and probably had the most entertaining and eclectic range of artists of any evening of the whole event, all appearing on Stage One. 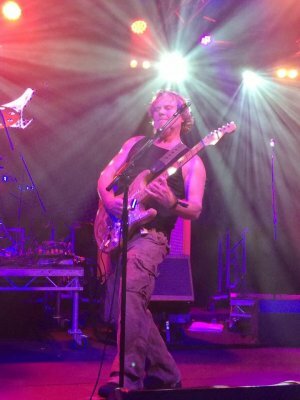 Veteran Prog band Jump, with local connections through their engaging and amusing front man, John Dexter Jones, opened the proceedings in impressive style. Their set was dominated by their fine recent album Over the Top, with songs filled with fascinating stories and hook laden choruses with hints of folk. Ronnie Rundle shone on guitar, particularly on 50, a song which applied to many in the ‘mature’ audience! 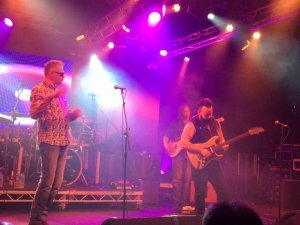 The finale of Johnny V, an elegiac but uplifting song about a local celebrity who died prematurely, was a personal and impactful climax to a fine opening gig, dedicated ‘In memory of those that bought the records’. This week The Enid consisted of a trio, and some were calling them ‘Threenid’. There are NO guarantees as to how many will be in the band by next week in the ever changing and bizarre world of this idiosyncratic entity! Devoid of any original band members for this performance, this young trio showed a new and different direction. 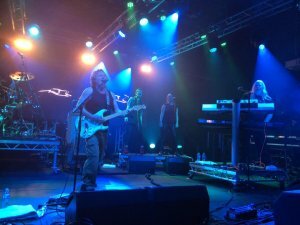 No more ‘West End’ style vocal dexterity from the now departed Joe Payne, whom delighted some and alienated others more fond of the band’s more orchestral instrumental past. This latest manifestation of The Enid has much more focus on instrumental passages, which is probably just as well as keyboardist Zachary Bullock frankly struggled vocally on Space Surfing. Thankfully, the singing improved as the gig built up momentum, largely through applying a choral and Vocoder effect to the mike. However, the focus of this show was much more on the music than the voice. 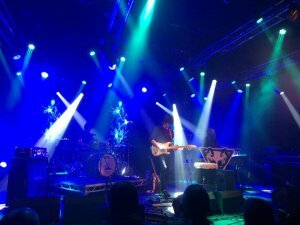 The Enid’s confidence grew with an interesting combination of darkly and richly textured rock, electronic and orchestral instrumental work. They weaved quite an entrancing spell full of drama and darkness, with guitarist Jason Ducker to the fore. What would HRH Prog be without The Enid? This is their fifth consecutive appearance at the festival (maybe next year HRH should give another band a chance!!!?). Nevertheless, they ensure that this is no carbon copy performance as they are effectively ‘re-born’ tonight. Fascinating and distinctive progressive material which bodes well for the future, with new album Resurgency in the works. Let’s just hope they do not fall victim to the ‘revolving door syndrome’ that has characterized the band in recent years! 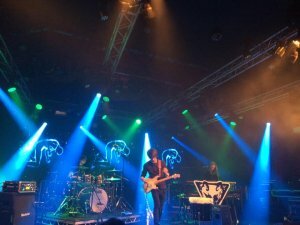 This was a simply marvellous show from these veterans, who delight the packed crowd with a set of classic ‘Prog’ illuminated with stellar guitar amidst a magnificent wave of keyboards from Clive Nolan, particularly on Paintbox. 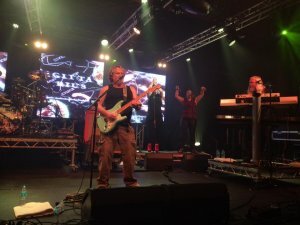 To celebrate the album’s 21st Anniversary, Pendragon commence their set with a trio of great songs from their classic Masquerade Overture, with the epic grandeur of Master of Illusion setting the crowd alight. 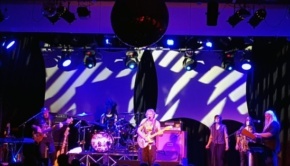 The band are supported by two female backing vocalists who add power and colour to the vocals, and particularly shine on rare song The King of the Castle. Beautiful Soul and Faces of Light from most recent album Men who Climb Mountains follow, and take on a new life on the stage. Stargazing is simply joyous with the crowd singing along, before Nick Barrett injects some social commentary on This Green and Pleasant Land with the refrain “Take only what you need and be on your way”. Barrett is simply wonderful on guitar throughout, particularly the brilliant Breaking the Spell, and the whole band was clearly feeding off the response of a very large crowd who were clearly ‘up for it’. Indigo from one of their best albums, Pure finishes a triumphant set in fine style. 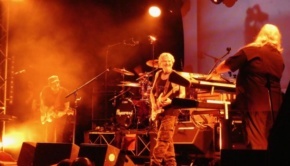 A fabulous gig to underline the class of a band that clearly thrives in a live setting. I did not know what to expect from Gong but these psychedelic masters lobotomize the packed HRH crowd with a spectacular performance that dazzled and bewildered. Since the sad death of Daevid Allen in 2015 the torch has been handed on to Kavus Torabi (also of Knifeworld), colourfully and skillfully supported by Fabio Golfetti on guitar, Dave Sturt on bass, Cheb Nettles on drums and Ian East on sax and flute. Drawing on their 2016 album Rejoice! I’m Dead! with Kapital, The Unspeakable Stands Revealed and Rejoice!, Gong proceed to blow away any reservations in the crowd with a spellbinding show of mind bending colours and absorbing music. I knew virtually nothing about their music and knew none of their songs… but it’s an indication of the entrancing quality of this gig that my ignorance of their material did not seem to matter one iota. In Kavus Torabi Gong have found a worthy successor to Allen, with a charming eccentricity and also stylish guitar. His quirky comments included an observation that “Men are Green and Women are Blue” which mystified most until he urged us to “look with your own eyes”… at the back of the auditorium where the toilet signs were indeed of those colours! 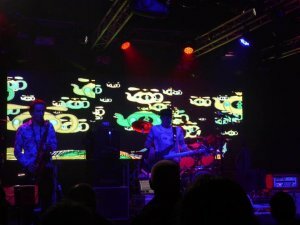 It’s an indication that Kavus Torabi and his gang just have that ability to turn a rather mundane setting in a holiday camp into some sort of blissed out Planet as they led us all off into space with a powerful set, including I Never Glid Before from their classic album from 1973, Angel’s Egg. 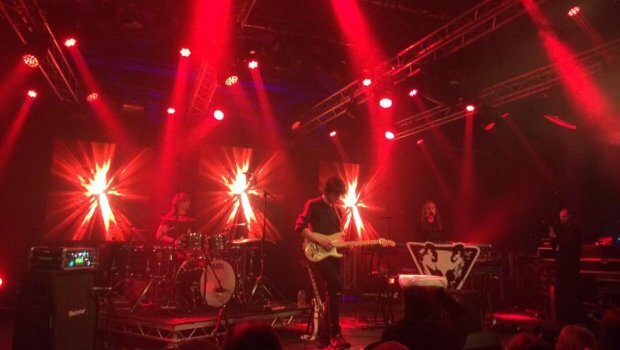 In a set glittering with delightful, dreamy visual imagery and enchanting sounds the undoubted highlight was the relentless drive of Master Builder, all the way back from 1974’s You, which never seemed like it was going to stop – staggering stuff indeed. 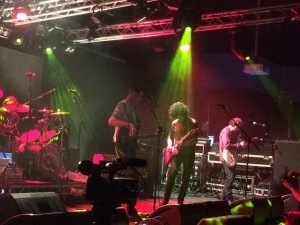 Kavus Torabi observed that this was quite a gig and suggested that it was “Better than most Thursdays” – oh, yes indeed, Kavus, most definitely! Thursdays aren’t usually this good. You can read the report from Day Two of HRH Prog V HERE and Day Three HERE. All photos by Leo Trimming, used with thanks.